My job as a music teacher is to help students understand the basic elements of music. Rhythm is the most difficult of the “right-or-wrong” music elements (the others are articulations and pitches.) Mastering rhythm often requires multiple approaches. 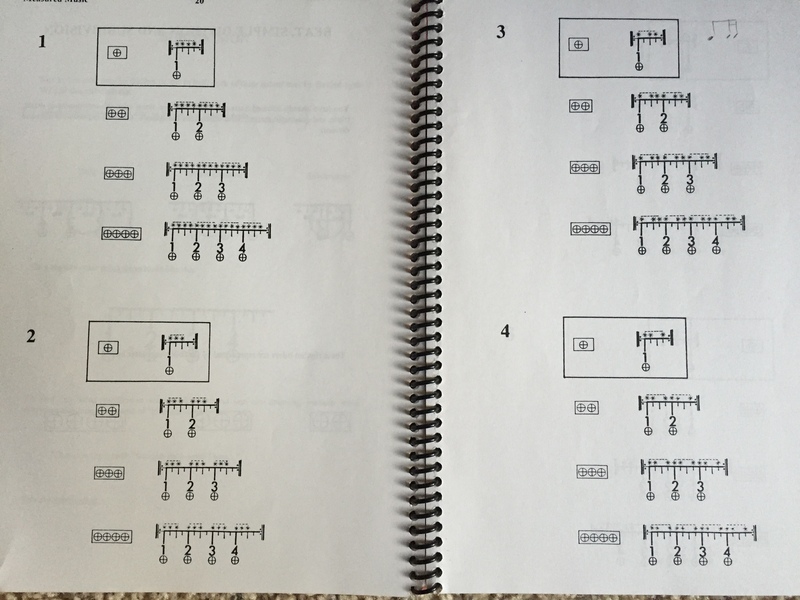 Connecting music and math is one approach. We all have different learning styles. One model of learning suggests that we have a preference for visual, auditory, or kinesthetic experiences. Understanding where your strengths are in the visual-auditory-kinesthetic spectrum can direct you to helpful systems of learning. Here’s a link to the VAK Learning Styles Survey . Some students resonate with a kinesthetic understanding of rhythm. They need to feel the beat in their bodies. In the studio, we may use marching, bouncing balls, and/or conducting the music to help students internalize the beat. For kinesthetic learners, Dalcroze Eurythmics is helpful. Other students prefer to hear the rhythms. These are auditory learners. The blog post “Rhythm Silliness” talks about the words I like to use to help students learn rhythm by ear. We use words like “Mississippi,” “peanut butter” or “R2D2” for sixteenth notes. We do a lot of playing rhythms together or I’ll play one measure and the student will play it back. Visual learners often prefer a more analytical approach to learning rhythm. Charts and visual aids are helpful to folks who have strong visual skills. If you are one of these people, read on! This blog post is for you. This blog post will show three mathematical concepts and how they contribute to a deeper understanding of the division of the beat. My son brought home his fifth grade math book last night. This is from an introduction page to a unit on fractions. 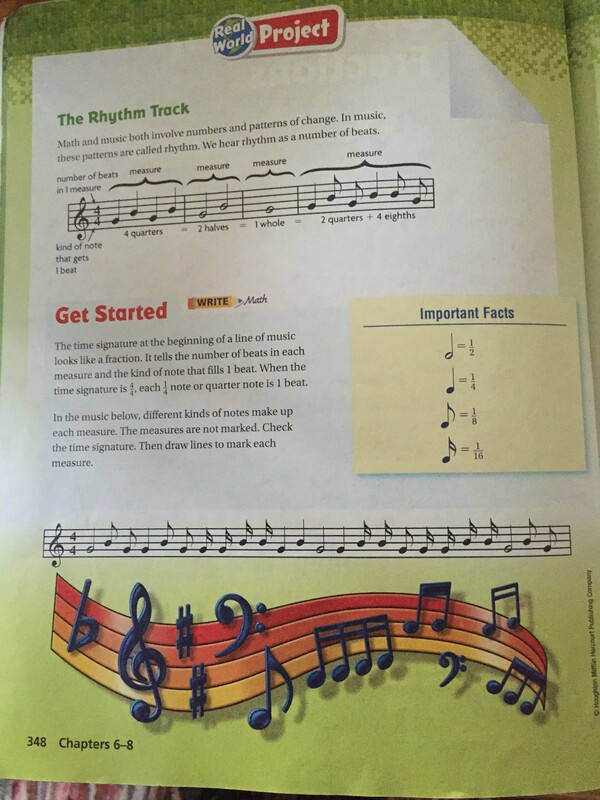 This page clearly shows the relationship between music and math. It even points out that the time signature looks like a fraction. By adding the note values at the bottom of the page, students can figure out where the barlines are supposed to be. A word of caution: I have observed that younger students can be confused about fractions. They think that if a pie is divided into two parts, there must be more pie because two is more than one. For this reason, I don’t use fractions with young students until they have studied them in math at school. I have had the most success using rhythm words to teach rhythm to young students. However, once a student understands fractions, the concept is easily applied to music and deepens the student’s understanding of how the beat is divided into equal parts. Notes that are tied together become easy math problems. (1/4+1/4=1/2) Students who understand fractions have an easier time subdividing the beat, as they have to do when the eighth note is the value that gets one beat. If you look closely, you can see that there are lines for 1/4 cup, 1/3 cup, 1/2 cup, 2/3 cup, 3/4 cup, and the top is one whole cup. 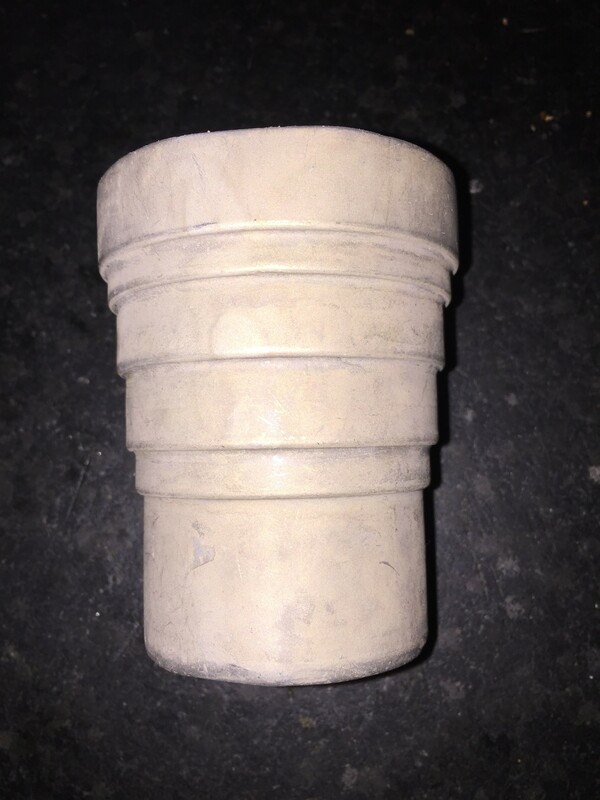 Imagine that this one cup of flour is a quarter note. That note can be divided in many different ways. Three 1/3 cups = 1 cup in the same was as a triplet will divide a quarter note into three equal short notes. I like to think of the image of this measuring cup when working on rhythms that switch between eighth notes and triplets. I have a clear mental image of how triplets in one instrument and sixteenth notes in another will line up. Music and math makes great cookies! A ruler has whole numbers (1, 2, 3, and so forth) that indicate inches. The inches have smaller divisions also. The longest line is at the half-inch mark. Shorter lines indicate the 1/4 and 3/4 inch. Finally, the smallest lines divide the 1/4 into 1/8 (and sometimes 1/16). Buckvich’s system also uses small circles, like mini pies, to show the subdivision of the beat. Sometimes the smallest subdivision is 1/2, other times it is 1/3. In the above example, you will see that it is 1/4 or the sixteenth note. 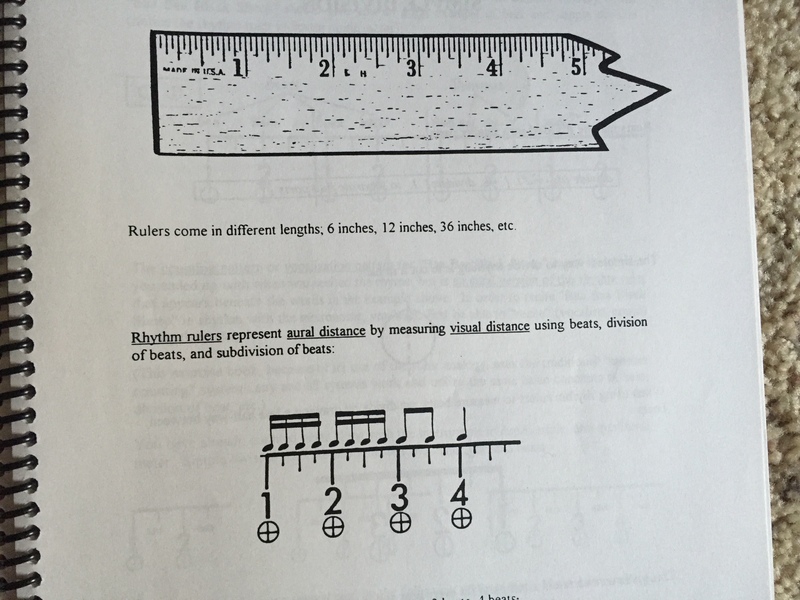 Below is a page from later in the book showing complex rhythms. I love how visual this music and math system is. If your brain isn’t wired for this kind of math, that’s totally fine. You likely need another system for internalizing the pulse and subdividing the beat. As I mentioned earlier, there are other systems for teaching rhythm that are good for kinesthetic and auditory learners. If the above music and math concepts work for you, great! Use them to deepen your understanding of the division of the beat. Visually overlay a ruler, a measuring cup, an apple pie over difficult rhythms. Continue to explore how the fractions can be overlaid and be prepared for some “Aha!” moments of your own. Music is a beautiful, mathematical marvel. If you liked this post, you may also be interested in learning about the math concepts behind the harmonic series, music theory, acoustics, and instrument design.